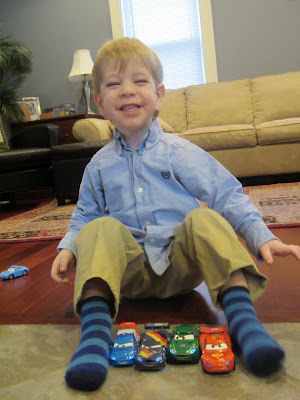 J has taken quite an interest in Disney's Cars lately. He can quote parts of the movie, name all the Cars, and is frequently seen zooming around on the floor with Lightening McQueen. Cars from the first movie are quite difficult to come by now since they are no longer sold in stores, but thankfully Nathan was able to find some of them through Craigslist. J also has quite a few cars from the Cars 2 movie. Despite the growing number of cars it seems that S and J continue to have disagreements over whose is whose and who can play with which car at any given moment in time. Often they fight over who can play with a car only to find about 10 minutes later that same car is sitting alone while neither kid wants to play with it... sigh... but, J is so cute zooming his cars around it does make up for it. Ka-chow!